in various field, have the intention to serve the community in the field of education. The existing school classrooms are only sufficient to cater for 1998 school enrolment. The school is in dire need of adding more classrooms especially for 1999 school intake which starts in January 1999. For this purpose, the school is in the midst of building a 2 story school building with 8 classrooms. The cost of this building is RM240,000.00 or about US63,000 (US Dollars Sixty Three Thousands) (USD1.00=RM3.80). 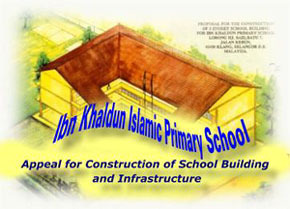 We are still short of fund to complete the construction of this building. We humbly wish generous donors for monetary assistance so as to enable the school to succesfully construct both the above school buildings.